Nobody likes a lush tropical island better than Sam Lyons. 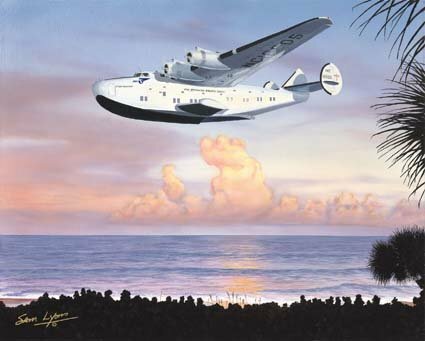 That's what inspired him to paint this magical scene featuring a wonderfully detailed Dixie Clipper. Whenever he needs a break from hours at the easel, Sam pictures himself in the pilot's seat, ready to land in paradise. You can do the same by ordering a stunning framed Giclee Print on Canvas. Image size is 20” x 16” and it comes complete with linen liner and genuine wood frame ... all ready to hang. There will only be 25 of these beauties produced. Don't miss your chance to own one!